The first season of Seitokai no Ichizon is my favorite anime of all time. The second season is decisively not as consistently powerful as the first, but still has some great moments. It's more of the same: a surprising amount of character development, some dramatic moments, and of course, comedy. The main complaint you hear coming into this show is the change in voice actors. I'd be lying if I said it didn't bother me, but it is still making mountains out of molehills. Mafuyu's new voice was similar enough that I just now had to look her up to double-check that her voice actor had indeed been changed. Chizuru's new voice actor does a good job, but could not perfectly emulate Chizuru's darker moments. Was it jarring? Yes. Was it a big deal? No. As a continuation of the first season, Seitokai no Ichizon Lv.2 is surprisingly good at not falling into the trap of "we'll just keep doing the same stuff." This praise might be better aimed at the light novels, but I haven't read them. It maintains its prior combination of sharp, fast wit; engaging characters; and the occasional drama, but it manages to feel new at the same time. The series starts off slow (and let's be honest, disappointing). Some viewers, including myself, might be interested in exploring Ken's backstory, though I can't fault those who just want to skip to the comedy. The student council members' interactions with new characters are one of the show's highlights. Ken's two ex-girlfriends make an appearance and make waves. The return of the scheming Lilicia (OHOHOHOHOHO) and her clairvoyant, dramatic irony-filled sister Elise are as enjoyable as the first season. That isn't to say that the student council members are completely neglected, though. Their identities, personalities, and most of all, their relationships are development splendidly. Without spoiling too much, fans of certain student council members will be delighted to see a couple episodes in particular. Despite all that, Seitokai no Ichizon Lv.2 has a couple glaring weaknesses. It takes several episodes to return to the first season's fast-paced humor. These episodes aren't necessarily bad, but they are noticeably weaker than the rest of the series. And while not exactly a negative, the sequel does have quite a bit of serious moments. I like that the series occasionally takes a break from comedy, but I've heard complaints from others that the "drama" isn't executed very well. This sequel also has a surprisingly touching ending for a slice of life comedy. Overall, Seitokai no Ichizon Lv.2 is more of the same, in a good way. Didn't like the first season? Well, I don't even know why you're reading this. On the fence? I'd recommend giving the second season at least 4 or 5 episodes to get rolling before making any hasty decisions about dropping. Loved the first season? Well, what are you waiting for? I will come out and say as someone that's watched both seasons that Seikotai no Ichizon had the most interestingly diverse lead cast of characters. From the beginning stretching back to the first season, it was a fun ride seeing their adventures over these past two seasons. You had Ken the hopeless harem junkie Vice President, Kurimu the childish Student Council President, Chizuru the dark and sadistic Secretary, Minatsu the athletic and ambitious VP, and her BL video game loving sister Mafuyu the Treasurer. You throw these five together and you have a half-hour of pure hilarity every week. It is unfortunate to say this but despite the cast of characters being amazing, I don't think AIC ended it on the strongest of notes. While I can say that this was still a good series, it didn't capture the same magic the original series did. The first season of Seikotai no Ichizon wasn't only brilliantly written from a comedy perspective, but there were moments in that series where we experienced Ken's heartfelt interactions with each one of them at one time or another. Lv 2 seemed to be lacking in that department. I'm not sure if it was due to only having nine episodes to work with (excluding episode 0), but the series felt as though it had a lack of great character interaction toward the end. It was pretty evident what this series lacked and it was the writing. One thing that the original Seikotai no Ichizon series was able to do was not only write great laugh-out-loud, crazy comical moments, but also able to connect the audience to Ken's character and the importance the four other student council members meaning to him. Studio Deen was able to capture both of those styles perfectly while not letting the comedy or the drama outdo each other. While AIC did do a commendable job of capturing each character's personality, it really felt like the chemistry was a bit off between the Student Council members and in particular, with Ken. I was really disappointed with how they ended the series because it felt as though Ken's connection with the Student Council was more distant than it was in the original series and AIC seemed to try and dump all of it in the last 5 minutes of the show. As I said earlier, it felt REALLY rushed and in comparison to the first season, didn't seem to capture that same chemistry between the characters. Perhaps it was due to legality, but I also found the sketch writing to be a little odd. One thing that made the original series so great was it's pop culture references, in particular to other anime series. This series, on the other hand, took a different route and didn't reference "other" animes per se, but rather itself. It treated itself like it was a popular anime/manga and would occasionally reference that in the series. While I do give AIC some credit for trying something different than it's predecessor, I didn't necessarily like that angle. It didn't make for as funny of moments and it took away the feel that Seikotai no Ichizon is its own entity. It's not every day that you see an anime try and break the 4th wall, but to be honest, I wish they wouldn't have. If there is one thing the writers did do pretty well, it was the introduction of new characters and the rollover of existing side characters. Satori, Lilica, and Elise made a return from last season and I found the additions of Asuka, Ringo, and Luna to be welcome additions in their own right. I did get a good impression that if this series does continue, AIC did do a nice job of setting up Asuka, Ringo, Luna, and Lilica to be potential Student Council members if the series decided to take that route. Considering the personalities of those characters, I think that would make a pretty interesting series if AIC does decide to go that route. As for the production values, I can only say it was good, but not great. There were some minor changes in the animation from the first series, but they weren't very noticeable. I can't really say they were better or worse. The music and for the most part, the voice acting is about the same with a casting change with a few characters. Although, even with a few minor casting changes, it did throw off the chemistry slightly. The original VAs had such great chemistry together and while the changes weren't "terrible", they were still noticeable and made it a little difficult to adapt. I can't really fault it too much since the VA changes were to just Chizuru and Mafuyu, but like I said, it did mess up the chemistry between the VAs a little bit. Overall, I cannot say that this season was bad. It was still an okay series in my book, but when you put the Seitokai no Ichizon name on something, you're competing with an already established franchise that is considered one of the better anime comedies to come out in the last 5 years. AIC just couldn't match what Studio Deen was able to do in 2009 and as a result, seemed to put out a lackluster conclusion to a great anime comedy. A fair anime in its own right, but unable to live up to its predecessor. It is advisable to read this review after seeing the first season of Seitokai no Ichizon. Seitokai no Ichizon Lv.2 is a very enjoyable anime with a good comedy and some heart-warming moments. But let’s see if it is different from the first season. 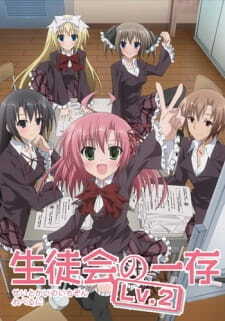 Student Council's Discretion, Seitokai no Ichizon, has the following genres: comedy, parody, school and harem. The anime is based on the light novel by Aoi Sekina and Kira Inugami; the show was produced by AIC and it aired between October 13, 2012 and December 15, 2012. The anime has 10 episodes in total. Just like in the first season of Seitokai no Ichizon, the second season doesn’t have the story-line, because all episodes aren’t connected and the events of one episode don’t add much to the next episode. But unlike the first season, most episodes of the second season have more scenes taking place outside of the student council’s room, which was made in an attempt to make the second different from the first. The story-line continues from where the first season ended with only 6 more months until the graduation day, with Kurimu and Chizuru graduating, and Minatsu and Mafuyu moving schools, leaving Ken with the task of creating his harem much harder to accomplish. So, throughout the second season, Ken tries to make the four girls happy and to show them how much he loves them. The comedy part in the second season was somewhat weaker than in the first season; yet, the character development received much more attention than in the first season. But for some reason the interaction between the characters felt forced and unfeasible. Seitokai no Ichizon Lv.2 uses a very similar art style to the first season, with the only noticeable change being the use of brighter colors and a smoother look to the animation, which made the show more attractive to the viewer. Another difference was that the student council’s room was different from what it was in the first season. In Seitokai no Ichizon Lv.2, more time was given to the scenes outside the student council’s room, which was interesting, since they showed other places, including Ken’s room. This gave the viewer something new, instead of keeping them just in the student council room and in that room only, which the first season did most of the time. This also allowed the viewer to see other parts of the characters’ lives outside the student council room. All in all, the characters still look well-designed and pleasing to look at, just like in the first season. Seitokai no Ichizon Lv.2 captured the same feeling with the music like the first season did. The new opening for Seitokai no Ichizon Lv.2 gave a nice feeling, with its soft and cute vocals, while the ending, unlike in the first season, was sung by the female singer. The background music was well-made and each musical piece fitted the mood of what the characters were taking about. The voice actors/actresses did one hell of a job voicing their characters; their characters felt to be real and I did like it. The anime follows five members of the student council at Hekiyou Academy. --Kurimu Sakurano, voiced by Mariko Honda (Yuuko Aioi from Nichijou and Mazinger Z from Robot Girls Z.) She is a child-like president of the student council, who acts somewhat childish and loves sweets. At the beginning of nearly every episode she writes briefings on a white board. In season 1, Ken revealed that he met Kurimu in the spring, while helping her carry boxes. --Chizuru Akaba, voiced by Mina (Yuuto Amakawa from Omamori and Sohara Mitsuki from Sora no Otoshimono) She is a sadistic secretary, who loves Kurimu and is always trying to cuddle and abuse her. Ken met her in the autumn, when he was suffering from a broken heart by the two girls he loved. --Minatsu Shiina, voiced by Misuzu Togashi (Origami Tobiichi from Date a Live and Yukiteru Amano from Mirai Nikki.) She is a tomboyish vice-president, who loves shounen to a point that most of her suggestions are based upon them. Ken met Minatsu in the summer. --Mafuyu Shiina, voiced by Iori Nomizu (Zuikaku and Shoukau from Kancolle and Nymph from Sora no Otoshimono). She is Minatsu’s little sister and the club’s treasurer. She is addicted to video games and loves BL novels. Ken met Mafuyu in the winter in an online chat room. --Ken Sugisaki, voiced by Takashi Kondou (Hibiki Laytis from Fairy Tail and Takumi Kaizu from _Summer.) She is the valedictorian, or “blue chip” seat of the student council, because of being the highest scoring student in his group. He loves to play eroge and bishoujo games. He dreams and plans to make the rest of the student council members his harem. Seitokai no Ichizon Lv.2, did feel to me weaker than the first season, but it is still enjoyable to me. The story was interesting and it had some funny moments, but in comparison with the first season, it had a more serious feel to it, whereas the first season was more focused on the comedy. The art was pleasing and the sound delivered the same feeling, apart from the two things: firstly, most of the ending songs didn’t give me the same feelings like the ones in the first season and secondly, Chizuru’s new voice actress couldn’t give me the same feeling that the old one did, especially in the sadistic scenes. But aside from that, it was a very good watch. Seitokai no Ichizon Lv.2 suffers from what sometimes happens in some sequels: the prequel overshadows the sequel. While Seitokai no Ichizon Lv.2 was still enjoyable to watch, it just wasn’t able to match with the first season. This desire to spend enough time on the characters’ development only ruined the second season. Did they want to make a good comedy, or perhaps did they want to make something more than a romantic comedy? That is the question I can’t answer. All in all, if you didn’t like the first season, there is no reason for you to watch the second. It is not an eye-candy, it is a show, which will help you to chuckle and just to kill your free time. Give it a try! Now that things are warmed up for Ken, Seitokai no Ichizon returns, now as romantic comedy. Focusing less about parodies and much more onto Sugisaki's relationship with all other members, this second season brings some deeper moments and an overall development regarding our male protagonist's attitude. Regular activities from the council keep going on and new situations occur even outside it. Ken's past has a special focus, as both his sister and childhood friend are now introduced and get the chance to have some "screen time". After one year as a council's member, it's expected that Ken had progress on his dream of having his own harem. However, someone that aims for that kind of thing out loud may not get too far... Still, he was able to turn into a totally different person after spending his time with all the girls. Design got smoother and brighter, but overall features remained the same. Seitokai no Ichizon Lv. 2 now features distinct songs for every ED theme. They are all sweet and beautiful, performed by the voice actresses, like on the previous season. The new OP song isn't too different from the first one. Both have the same style and rhythm, so they're really alike. While all members from the council remained the same (obviously), Ringo and Asuka are introduced and both have the opportunity to have their own episodes, as protagonists. Ken's half-sister, Ringo is a sixteen years old sweet girl, that loves her brother from the depths of her heart. She's responsible for triggering up tons of jealously on the other girls during their encounter on the council's room. Asuka is Ken's childhood friend, whose tries to get closer to him again and start over, to put and end to his harem ambitions. Regarding the other girls, it's clear how Minatsu's attitude towards Ken has changed a lot. She became the one with the highest probability of getting into a love relationship with him. Now that Ken has a strong friendship with all the other girls, the time to get deeper has come. Becoming a member from this student council helped him getting more mature and making his own decisions and his unconditional love for everyone, despite mostly misunderstood, is true. Kurimu, Chizuru, Minatsu and Mafuyu... They saved Ken on their own different ways and created a path for he to reach happiness... Will he be able to show his appreciaton over their efforts before it's too late?